There are many forms of sunshine, and the liquid variety was abundant as I headed from Galway to Kilkenny; but I had high hopes that it would clear for the Hothouse Flowers show this evening. Although I haven’t driven a car for several months, I had no trouble navigating my way through the gridlock still gripping Galway. Not once did I want to drive on the right side of the road – a sign to me that I’m where I’m meant to be. Maps in hand (yes, plural), I made my way south east. It wouldn’t be a proper road trip if I didn’t get lost at least once. Lost isn’t technically the right word, since I eventually always end up found – maybe detoured is a better way of explaining my travels. Despite my detailed Google Maps directions, something went awry around Roscrea. I’m thinking the wee folk need a bit fun and move the signs or change the directions for entertainment, and I’m happy that I can oblige. I took a scenic detour through an interesting little town called Durrow. 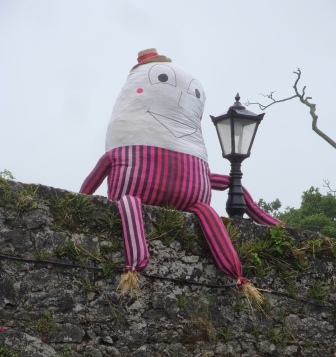 The huge stuffed humpty-dumpty near the entrance to the town was followed by more stuffed figures, and I was beginning to wonder if I’d slipped into wee folk territory when I saw the signs for the Scarecrow Festival. An assortment of booths had been set up in the middle of town and I followed the Scarecrow Trail, admiring the creativity of the townsfolk, as I made my way back towards Kilkenney. 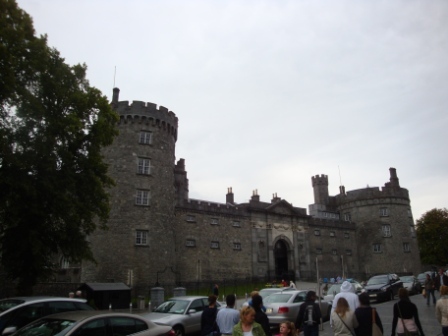 First stop was Kilkenny Castle – I’m drawn to them like moths to a flame. I recognized the Design Center immediately, from my first bus trip through Ireland. I bought what is still one of my favorite pendants there nearly 10 years ago. For the life of me, however, I can’t remember having gone through the castle, previously. 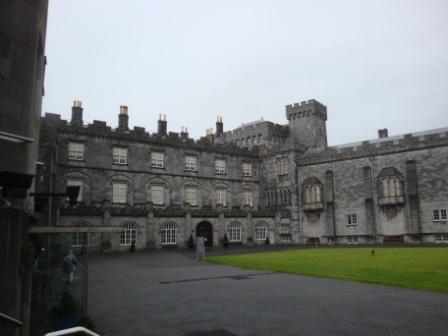 It’s an impressive structure, located on the River Nore, and although only parts of it are open for viewing, it was one of those places where I felt right at home – no ghosts to chase me away. As I wandered through on the self guided tour, I found several architectural details that I plan to use in my novels. You’ll have to wait and see which ones (hopefully not long). After checking into the B&B I headed for the venue – The Orchard House Pub. It was to be an all afternoon and evening event to raise money for the Jack and Jill Foundation. It may have been the weather, the bank holiday, or all the other events going on this time of year, but the crowd was nowhere near what I, or the sponsors, expected. It’s a shame, as the music was very good, capped off by Hothouse Flowers, the reason I came out this way. The first gentleman I spoke with was named Gary, and we had a very interesting conversation about the meaning of life – both of us searching for but not yet finding a suitable answer. I hope you find out one day soon, Gary. There is an answer for each and every one of us, I’m convinced. It just takes some of us longer than others to discover our true path. I hope to find mine soon as well. The next chap approached me while I was writing – one of the things I do to bide the time and help me feel less out of place. It was a good opportunity to capture the essence of the castle. I don’t remember his name, for which I apologize – I’m admittedly terrible with names, though I do remember he was from Cobh. The last was a couple, Jean and Frank (if I have your names wrong, let me know and I will make the corrections – you did promise to keep in touch). Jean saw me watching the concert off to the side by myself and dragged me in to dance in the center. I had started off to the side, as it wasn’t quite as loud and I wasn’t inclined to damage my hearing, especially when there is so much amazing music to be heard. However, by then they had either turned it down a little or I had adjusted, and, since she wouldn’t take ‘no’ for an answer, joined her in the center of the small crowd hovered around the stage. Not even a few sprinkles could dampen the spirits of the band or the music enthusiasts, forcing the errant weather system to move on. The band played with the same enthusiasm and genuine love of what they do as I had seen previously. Liam briefly sported a ten gallon hat which I suspect he picked up on his recent tour of the US. I chatted for a little while with Jean after the show and she encouraged me to think positive about my efforts to reside in Ireland. It’s sometimes difficult to stay optimistic in the midst of the ‘slings and arrows of outrageous fortune’ that seem to be constantly in my path, but I continue to believe that I must follow my dream and encouraged her to do the same. Hers is to visit and potentially live in New York City. Though there was never any conventional sunshine, the essence emanated brightly from the music and the warmth of new-found friends and acquaintances. The extraordinary music; the warm, welcoming people; and even the strange and wonderful detours are just some of the reasons I love Ireland.